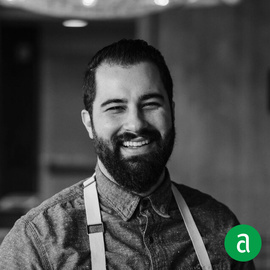 Andrew Isabella, Executive Chef at BeetleCat in Atlanta, shares his career timeline and words of advice for up-and-coming professionals. I grew up fishing with my dad and it's something I still really enjoy. This hobby goes hand in hand with my skill and passion for butchering fish. I work closely with my team on a level that allows me to get to know each one of them on a personal level. I enjoy getting to know my team, learning what their hobbies and interests are, and really encouraging them to drive that by creating and collaborating on menu items or techniques. When hiring, I look for passion and good attitude. It’s not about their skills; it’s more about their attitude and willingness to learn. I continue to educate myself by reading and eating through cookbooks. Our relationship with farmers is invaluable. They are the backbone behind everything we do. My experience working for Executive Chef Brandon McGlamery at LUMA on Park was a defining moment in my career. He taught me the fundamentals of cooking, and really channeling my passion for food into my career.